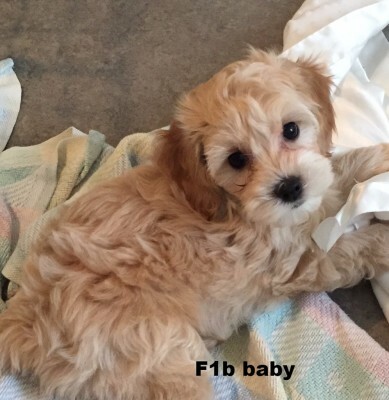 Our Cockapoo Puppies are First Generation, F1B and F2 Cockapoos. 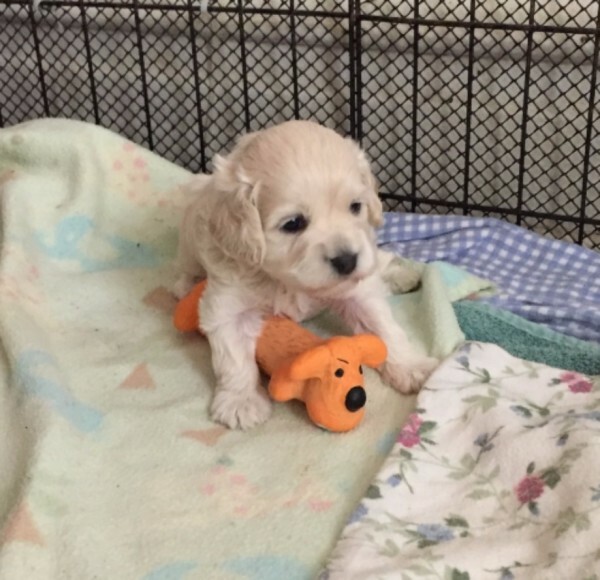 After much research, in 2020 Cockapoo Cottage will be offering Mini Goldendoodles and Cavapoos. As there will only be one breeding pair of each, litters will be limited. They are extremely intelligent and enjoy training. Grooming can be done by a professional or at home. The curlier the coat, less dander and great for those with allergies. If someone tells you a dog does not shed, this statement is incorrect. The cockapoo sheds very little, and any shedding can be maintained with regular brushing. 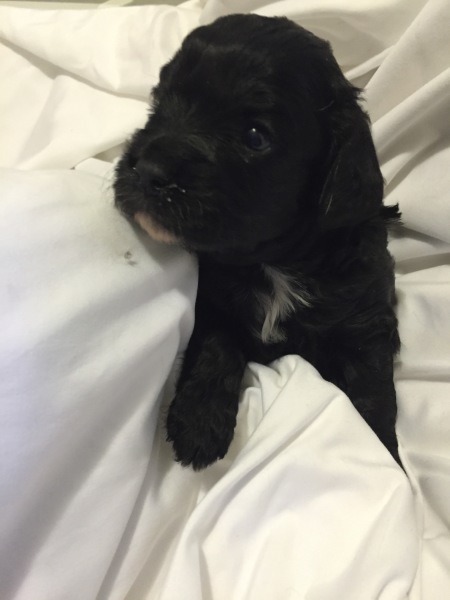 The cockapoo is especially suited for Medical Alerts, such as seizures, diabetes and allergies . There are also wonderful companions for those suffering from autism, PTSD and anxiety. The unconditional love that they offer you, is one the best medications and therapy. 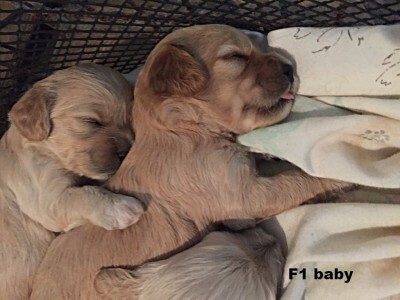 using my family tree and babies that I raise, there will be more F1b and F2 litters. COAT - Cockapoos offer a variety of coats in texture and appearance. 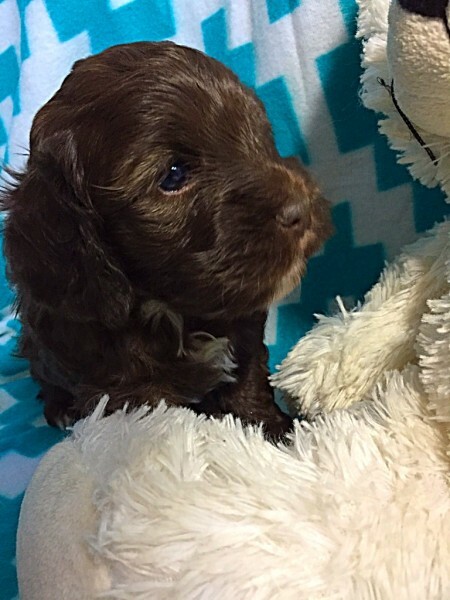 Cockapoo puppies will show a curly coat a few weeks older than the wavy coat. The curlier the coat, the less dander and shedding which is characteristic of the poodle. TEMPERMENT - Cockapoos are very friendly and outgoing and it is important to keep them socialized. They need to meet other humans and pets or they become overly protective of the immediate family. Cockapoos can adapt to apartment living as well as living on a big farm. It is extremely important that you have play time with them for exercise. They have a keen intelligence and are very easily trained. As with any pack animal, the cockapoos have physical, intellectual and social needs that need to be met. You may have only one cockapoo at home, but you and your family are the pack. HEIGHT AND WEIGHT - Cockapoos vary dependent on their parents. But on the average, most weight less than 20lbs and average on height at 18" at the top of their heads. EAR CARE - Ideally ears should be cleaned when you bathe them, but it is also wise to check them weekly. Cleaning is easily done by dipping a cotton ball dipped in coconut oil. Coconut oil is nonirritating and holistic; unlike many cleaners purchased through pet stores. 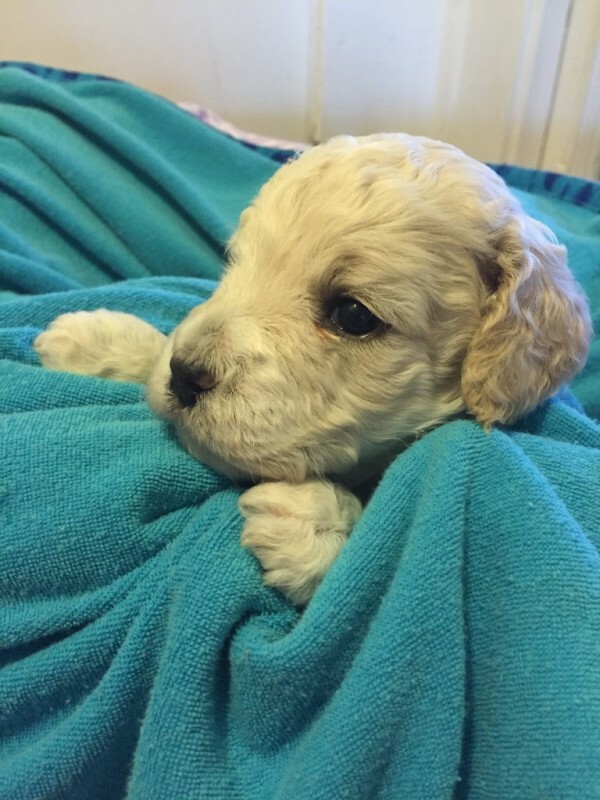 If the cockapoo starts shaking his head frequently or digging in his ears, this is a sign of an ear infection and best treated by your vet. EYE CARE - Hair should be kept trimmed away from the eyes. You will notice the lighter colored babies and adult have more tearing stains.. This is also seen in darker coats but not as noticable. Instead of buying some thing expensive, just take a wash cloth and warm water and clean the eye where you see the tears. Be careful not to touch the eye ball. NAILS - If you hear their nails click on the floor, they are too long. Most cockapoos will tolerate a nail trimming with very little fussing and just take a little bit off each week. It is recommended to keep a bottle of Qwik Stop on hand; if you trim off too much from the nail and it begins to bleed, the Qwik Stop stops the bleeding. Then reward them quickly with a treat. TRAINING - The best training tool that I have found, for correct inappropriate behavior, is to mix a spray bottle with half water and half vinegar. Adjust nozzle so it not on a fine spray, and do not spray it in their face. Between the shock of the spray and smell and taste of vinegar, you can correct a non-acceptable behavior in no time. Eventually all you need to do, is just pick up the bottle. When correct behavior is exhibited in training, use lots of praise and a small treat. POTTY TRAINING - I received many questions regarding potty training. Some babies are quicker than others, but they all require much patience. Upon waking and after meal time, take the baby for a walk and use verbal clues. In the house, I say. "Lets go out", and then neighbors hear me say, "Go pee". In the beginning I take them out every hour, then every two hours, etc. If you are successful, or I should say the baby is successful, give the baby lots of praise and petting. For the more difficult babies, I use one special treat as positive reinforcement. The baby will soon realize, that the special treat is only for outside potty business. After a while you will not need the treats. Or you can use a special toy instead of a treat. TAILS AND DEW CLAWS - While some breeders do dock tails and remove the dew claws, I DO NOT HAVE THESE PROCEDURES DONE. I understand that there are AKC breeds that need to have this done for showing, but for my babies, I will not put them through this trauma. 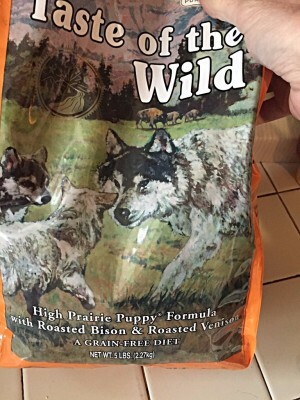 PUPPY FOOD - My babies are are weaned from mom with goats milk and grain free puppy food. All of my supplies are ordered through Chewy.com , Rural King , Tractor Supply and Smile.Amazon.com . (this site supports other nonprofit organizations). Chewy and Amazon offer subscriptions to have food, treats and toys delivered to your door at your discretion. Therapy dogs do not perform specific tasks for people with disabilities, but do need to have exemplary temperaments, obedience and social skills. Cockapoos know the importance of the job and look forward to it. Service dogs are trained for specific physical tasks and they are protected under Americans With Disabilities Act.